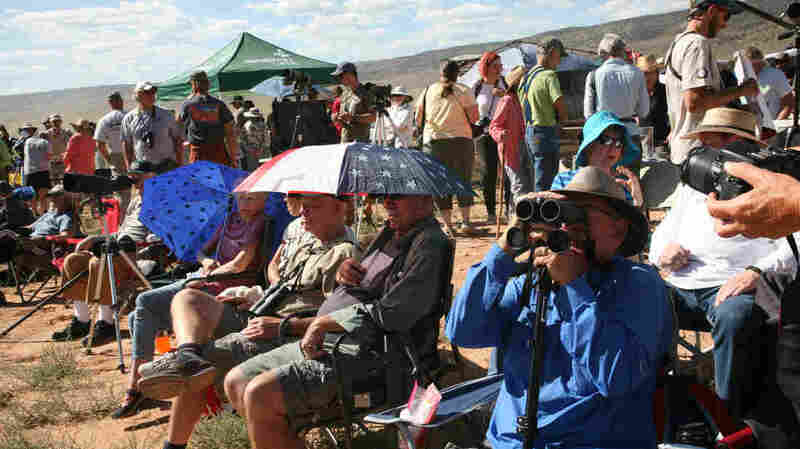 The Flight Of The Condors, And Their Audience Hundreds of condor groupies flocked to a spot on the Utah-Arizona border to witness the annual release of young condors into the wild. The Peregrine Fund recently released four California condors over high cliffs in Northern Arizona. In 1982, there were only 22 of these giant birds left in the wild. It would normally be easy to miss the dirt road jutting north from a tiny highway near the Arizona-Utah border. But not today, with the long line of cars rumbling toward lonely, rosy cliffs, and an encampment of bird watchers forming under them. They're all here for four birds. With a wingspan that can stretch nearly 10 feet, California condors are some of the largest birds in North America. They're also some of the rarest. After the population plunged to just 22 in 1982, all were taken into captivity for safe keeping and breeding. Once a year, just a few are released into the wild in Northern Arizona. Others are released in California and in Mexico. Chris Parish stands with a microphone in front of the growing crowd. "This is phenomenal!" he says, he voice carried by solar-powered speakers. "I think there are more vehicles here than we had people in some of the early releases." Parish is with the Peregrine Fund, which has been reintroducing California condors to Arizona for more than 20 years, with the help of various organizations and state and federal agencies. This time, 750 condor groupies have come to watch, with their folding chairs and binoculars, umbrellas and dogs. This year, more than 750 people came to see the release of the condors at Vermilion Cliffs National Monument in Arizona. Brigitte Le Vea takes a turn squinting through a high-powered spotting scope. "Oh my God! Oh my God!" she says, looking toward the top of the Vermilion Cliffs. "This is bananas!" She can see a pen housing four young, soon-to-be released birds. A handful of older condors, released years ago, are nearby, some circling and others sitting on the rocks, unfurling their big, black wings. "This is really, really, really special," she says, on the verge of tears. "I've been trying so hard all season to see a damn condor, and I'm finally here, and I'm so excited about it." Le Vea is choked up, even though she and the rest of the group are a half a mile away and a thousand feet below the birds. With their naked, pink necks, these scavengers sometimes get called ugly. But here, people like Lee Ann McAda use a different word. Charismatic. "Oh my God, how could they not be?" she says. "It's like, you look at those wings up there and you look at those heads and how they soar, how could you not think that they're charismatic? They're gorgeous." And worth her seven-hour drive from Grand Junction, Colo., all for something that could last two minutes or all day. When the pen is opened for the first time, you never know how long the condors will wait to take their first free flight high over the desert. Finally, biologists start a countdown. Then Tim Hauck, a biologist on the ground, radios to a biologist on the cliffs. It takes a moment for to open the pen's door. But then, a burst. "Holy cow!" Hauck says. "It never happens this fast!" Three condors fly out almost immediately, massive wings flapping against the sky. It's instant, elating gratification. And for Ron Brown, a park ranger at the Grand Canyon, it's deeply personal. "I was in the hospital three weeks ago with a pretty major heart attack," he says. "This is my first big thing was to come here, because I knew that this just makes you feel alive." His late wife Pat, thought so, too. Brown says the last time she was here, she was sick and probably didn't weight a hundred pounds. But she was glowing. Brown says that's the effect these birds — and the effort to save them — have on people. "This kind of thing is human beings trying our best to say, 'Together, we can do this,'" he says. Soon, the fourth and final condor flies free. Thanks to interventions like this one, about 300 California condors are in the wild. 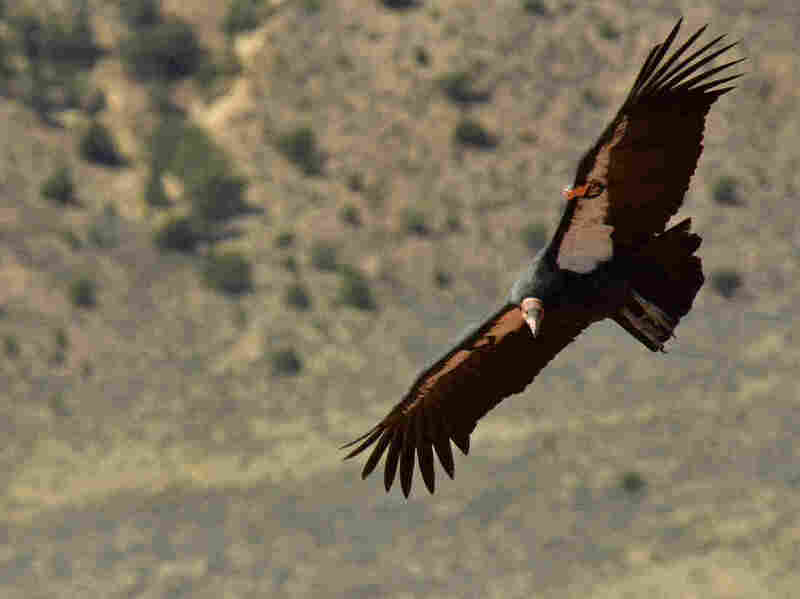 In the audio of this story, as well as in a previous Web version, we incorrectly say there are 500 California condors in the wild. About 300 are in the wild and 200 are in captivity in breeding programs, zoos and preserves.